The first step in this process initiated by the landlord can be a three or thirty day notice. The landlord may desire to have the Sheriff’s Office serve this writ. Fees for this are the same as standard service fees for other types of writs however there are no statutes that dictate a particular type of service or return day. Sheriff’s Office policy is to attempt service as soon as practical, and service could be either personal, residential or may be accomplished by posting a notice at the residence. The Sheriff’s Office does not provide forms for these notices, nor give advice as to their content. These forms are obtainable from several retail office supply businesses in North Platte. It should also be noted that this notice is NOT a court document. 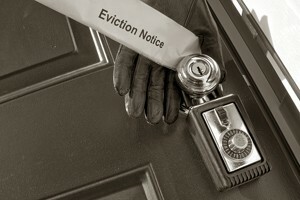 It does not order their removal; it simply tells the tenant that if they have not evacuated the property by the given day, the case will be taken to the court for an eviction process. After the service of the notice, should the tenant fail to move, the landlord may then commence suit in one of the courts. The Summons, or notice of suit, may be sent to the Sheriff’s Civil Division for service. It contains a time and date for trial and must be returned to the court within three days of its issuance. Service may be personal or residential. If the landlord prevails at trial, a Writ of Restitution may be issued. Service fees are required for service prior to receiving such writ from the court. A Writ of Restitution directs the Sheriff to remove the defendant and restore the premises to the plaintiff. It is the policy of the Sheriff’s Office to execute such writs by attempting to obtain voluntary compliance from the defendant in a fashion which minimizes any unnecessary hardship. In the absence of compliance, the Office will execute the Writ by removing the occupants personally and/or by changing the locks on the premises. The Office will remove personal property only when specifically directed to do so by Court Order. The Writ of Restitution may be executed within one to ten days of issuance (we do all Writs within three days (72 Hour Notice). Because of this relatively narrow window, it will be executed without delay. To expedite the process, the plaintiff should provide a contact name and phone number. Deputies will contact the plaintiff or the plaintiff’s attorney to set up a time/date for restoring the premises to the plaintiff. Deputies will determine whether the plaintiff desires to change the locks himself/herself or if the Sheriff’s Office Civil Division will contact a locksmith to do the work. Should the plaintiff choose to change the locks, the Sheriff’s Office is not obligated to stand by while the residence is being secured. Deputies will go to the residence listed on the Writ and serve the defendant’s copy. This may be by personal, residential, or posting service. If no one is home or they don’t answer, the paper may be posted prominently on the residence, most often on the front door. In addition to the Writ, a separate form provided by the Sheriff’s Office, or a hand written notice on the back of the Writ, will designate a lockout date/time and a brief explanation of consequences if compliance is not met. Barring exigent circumstances, a minimum of three days is given to allow the defendant time to vacate the premises with his/her property. Three days is generally recommended to prevent the plaintiff from having to dispose of property under the Disposition of Personal Property Landlord and Tenant Act. Generally, the Sheriff’s Office will not execute Writs of Restitution on weekends or holidays. On the date/time of the lockout, the Deputy will arrive at the location and remove any occupants from the premises. Occupants will be advised of trespassing violations they could be subject to if they return. Persons still having property in the residence will have to contact the plaintiff to arrange for removal of the property. Deputies will not take part in the disposal of property. Provisions for such are set out in the Disposition of Personal Property Landlord and Tenant Act. If the premises involved are rental properties such as a house or an apartment, and the premises have been turned over to the plaintiff, the Deputy has no further obligation. If the Sheriff’s Office has arranged for a locksmith to change locks, a bill will be obtained from the locksmith before the Deputy leaves.